It was day 2 of SuiteWorld 2016. We came to the SuiteWorld 2016 conference with the goal of showcasing integrator.io and its key features. 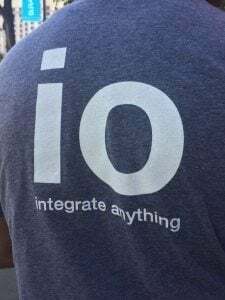 Inevitably, nearly every conversation we had during SuiteWorld ended with a demo of integrator.io as well as a barrage of questions about key functionality and the business needs it could solve. The excitement surrounding our game changing iPaaS exceeded our expectations given the interest from the broader NetSuite ecosystem. To further communicate the value of IO, the focus of our breakout session addressed connecting NetSuite and cloud-based apps using our integrator.io platform. Amit Saxena, VP of Product Management, focused on the simplicity of our product and emphasized the power of this integration platform for businesses of all sizes. Amit also highlighted our tiered pricing model that encourages companies to connect as many endpoints together as they need to effectively run their business. Suite World 2016 was off to a great start. We received great feedback from the partners, customers and prospects who attended our breakout session in that it highlights our ability to integrate anything to anything while being ecosystem agnostic. Even after the 45 minute breakout session came to an end, there was a flow of people back to our booth to continue the conversation about the capabilities of IO and how it could help simplify data integration. We love our customers. And we love to hear how we have helped our customers make their business more efficient. One of the most rewarding take aways from Suiteworld 2016 was the vast amount of customer success stories we heard. Because so many of our customers attended SuiteWorld 2016, we took this opportunity to videotape customer testimonials during the conference. We are thrilled about the number of ad hoc testimonials that occurred on the spot, in addition to the scheduled testimonials that we had lined up beforehand. This says a lot about our customer base and how well our products support their business needs. Stay tuned for these customer success stories to be published on our website. Another highlight for the Celigo team was having our global team members from our Product Management team in attendance to interact with and to receive direct feedback from customers, prospects and partners in order to understand their needs and share our product roadmap and answer specific technical questions posed to them. The invaluable feedback we received from our customers will be reviewed as we continue to enhance and work on our product roadmaps for future releases. Our platinum booth offered us a chance to not only engage prospects interested in our wide array of SmartConnectors, Productivity Applications and our integration platform, but also lended itself to educating our existing customers on the other products in the Celigo portfolio that could help transform the way they do business. The buzz at our booth surpassed our expectations. We had up to 25 Celigians manning the booth at peak times and there were several occasions where there were still visitors lining up to talk to us. The overwhelming energy at the booth wasn’t something we expected and it left us all with a sense of how passionate Celigians, our valued Customers and Partners, and interested prospects are about what we do. Speaking of our partners, there were a number of them that received honors at the conference and we would like to recognize them for their excellence in the NetSuite ecosystem. We are proud with what we accomplished this year at SuiteWorld 2016 and we can’t wait to see what is in store for next year’s event. Stay in touch by reading our blog where you’ll learn about the latest developments from Celigo and how we can transform data integration at your company! Engagement at the Celigo Platinum Booth! The NetSuite Mascot and Celigo!